Hillary: Sick, Sliding in the Polls, on the Verge of Being Replaced – Biden? The Toricelli maneuver. Get ready, folks. It’s coming. You remember Robert “The Torch” Toricelli. Late in the 2002 New Jersey Senate election, corruption-dogged Democrat candidate Torricelli withdrew from the campaign on September 30, 2002. Rather than risk losing the seat to a Republican, in a blatantly illegal maneuver after the filing deadline had passed, New Jersey state Democrats replaced Torricelli with retired Sen. Frank Lautenberg. The ex-senator easily defeated Republican Doug Forrester and kept the senate seat in Democratic hands. 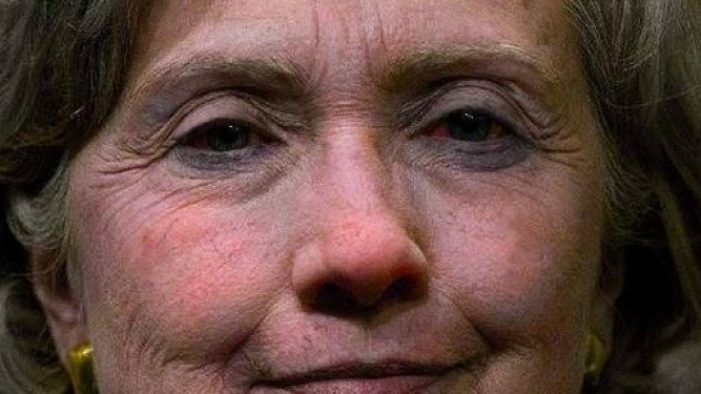 Hillary Clinton has just had the worst week in presidential politics, and it doesn’t look like things are getting better for her any time soon. First, she’s sick. There’s nothing like collapsing in public to show everyone that something is seriously wrong with this woman. After admitting to suffering from bacterial pneumonia and taking five days off from the campaign trail to rest up, the Clinton Campaign suddenly canceled a Tuesday fundraiser scheduled at a private home in Chapel Hill, North Carolina. The high dollar event was billed as “lunch with Hillary Rodham Clinton,” the event had four donation levels ranging from $2,700 to $33,000 to attend. With Hillary desperately needing to make an appearance, CBS News reported that Clinton campaign officials announced late Monday that the fundraiser was postponed. No reason was given for postponing the event. Cancelling a fundraiser in the vote-rich Raleigh-Durham area in a critical large swing state fifty days before the election is not a good sign. Earlier Monday, Clinton campaigned at Temple University in Philadelphia to deliver a speech to millennials, where only 300 college students showed up. 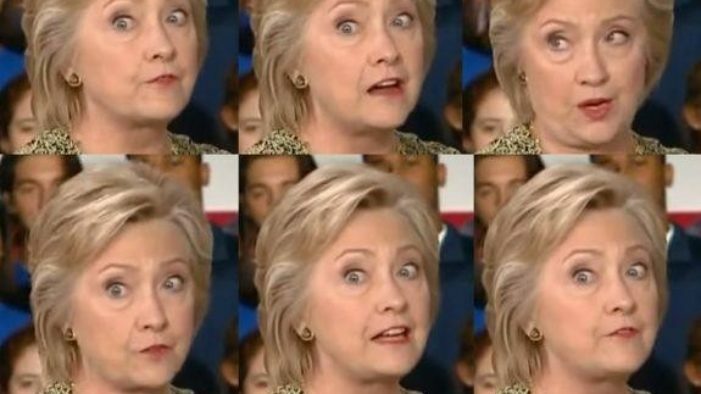 During the speech, observers noted something wrong with Hillary’s eyes. And then there are the polls. A month ago, the Real Clear Politics average of polls showed Clinton with an advantage of 47 to 41 over Trump. As of today, Clinton’s lead has narrowed to 45 to 43.9, a difference of only 1.1% and well within the poll’s margin of error. The latest Rasmussen Reports weekly White House Watch shows Trump edging Clinton 42% to 40%. A dozen battleground states have gotten closer, with some key ones showing Trump leading for the first time. Hillary Clinton retains a narrow advantage, but it’s a far more precarious lead for the Democrat than at any time in this presidential race. Then there’s the Electoral College. The latest Electoral College map from Real Clear Politics, which tracks and averages state polls, lists 200 votes solid, likely or leaning to Democratic nominee Hillary Clinton, 164 for Republican nominee Donald Trump, and 174 in the tossup category. 270 votes are needed to win. In reality, 13 states have become “swing states,” along with a congressional district in Maine — one of two states that splits its Electoral College votes instead of awarding them on a winner-takes-all basis. RCP’s “no tossups” map — which awards the votes to whoever is currently leading in the polls, even if that lead is within the polls’ margin of error — makes Clinton the winner with 287 votes versus 251 for Trump. Florida, which Trump leads by 0.9% in RCP’s average of state polls, is in the Republican’s column. This means that Trump, who has the momentum as polls tighten, only needs to flip 25 votes to reach that magic number — Pennsylvania (20 votes) and Nevada (6), for instance, or North Carolina (15), Colorado (9) and Nevada. The momentum is in Trump’s favor. Throw in the “basket of deplorables” gaffe and three terrorist pressure cooker bombings in New Jersey and New York over the weekend and it is beyond ugly for Hillary. If Trump doesn’t say something dumb on Twitter, his momentum will probably continue. Clinton is going into this debate unwell, on the defensive, and losing her lead in an election everyone thought she would be walking away with by now. If she tanks or even merely under-performs in Monday’s debate, Democrats are going to go from being “concerned” and “worried” to demanding that she resign. It’s one thing to be sick, but it’s another thing entirely to be a loser. Enter Joe Biden, tanned, fit, and rested. FEC filing deadlines be damned. Three days after the debate sounds about right, doesn’t it?